There were a few more sizes. Voted hot just picked up a few things from Atherton store. Is this a national deal? Damn, was just in there too! All Gone in Hayes....There were 5 when I was there, I took just the one. Picked up the Salter Scale @£3 too, only one left on the shelf. There Isn't an Atherton store??? All Gone in Hayes....There were 5 when I was there, I took just the one. … All Gone in Hayes....There were 5 when I was there, I took just the one. Picked up the Salter Scale @£3 too, only one left on the shelf. Anyone seen this in Stirling? Great price if you can find them. Saw it lunchtime in Cambridge.. Sorry Derpuss, I meant Leigh. Still 50% off in my Sainsburys. It ought to be "No evidence" = "No vote". Tefal seem to be on sale everywhere at the moment, Debenhams, Tesco and Sainsburys - what's going on ? Tefal seem to be on sale everywhere at the moment, Debenhams, Tesco and … Tefal seem to be on sale everywhere at the moment, Debenhams, Tesco and Sainsburys - what's going on ? Debenhams is a "virtual sale". I get tefal every year. They always seem to put them for sale in January. Have done the last three years to my knowledge. it is not local. a few cheap ones left in Winchester at 16.00 (£1 23 cm cake tins) and also plenty of other stuff 70% reduced. hot! I get tefal every year. They always seem to put them for sale in January. … I get tefal every year. They always seem to put them for sale in January. Have done the last three years to my knowledge. +1 - mostly 'special buys' and stuff nobody wanted in the first place. Even worse than that - supposedly bargains on great stuff, then they send you a cancellation email even though the website still says in stock! I see it as a dirty tactic to get more eyeballs on their site. Only thing 90% off in Stafford was a twin pack of Sainsbo's frying pans, or rather a sign saying some had been there. 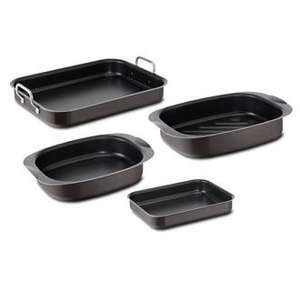 Lots of cooks collection stuff at 70% off though, I got a pack of heavy gauge oven trays for £6 which wasn't bad. Even worse than that - supposedly bargains on great stuff, then they send … Even worse than that - supposedly bargains on great stuff, then they send you a cancellation email even though the website still says in stock! I see it as a dirty tactic to get more eyeballs on their site. I have bought a few dozens of stuff from Debenhams Blue cross sale. My personal experience and I do not rememebr I ever got cancellation. If this is the three pan set with copper bottoms then they were 70% off in Stafford yesterday, looks like managers discretion what discounts are applied where. Newport is cleaned out, I didnt even get a look in! Hmm, Stafford was more cake tins/trays at 70% off and then most pots and pans were 50%. That was yesterday though, may nip back at lunch today. Anyone has any luck in London ? I have bought a few dozens of stuff from Debenhams Blue cross sale. My … I have bought a few dozens of stuff from Debenhams Blue cross sale. My personal experience and I do not rememebr I ever got cancellation. Consider yourself lucky - look at this or this. getting hot and in most of places just 50% sale?